This motorcycle carrier is designed for bikes with up to 5 1/2 Inch wide tires. The carrier measures 75 Inch and can handle motorcycles larger. The motorcycle pictured is a Suzuki 400 DRZ and measures 84 Inch from outside tire to outside tire. Extremely lightweight combination of aluminum and powder coated steel construction - 45 lbs. (all steel carriers usually have the same weight limit but weigh much more making it difficult to carry or store- and steel will rust). 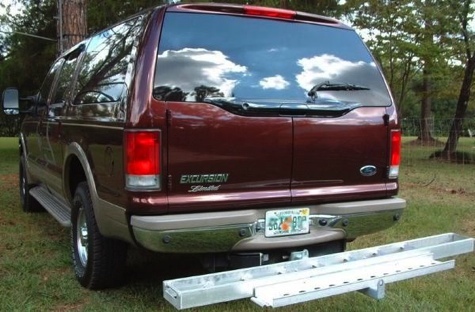 Also includes a lightweight aluminum loading ramp for loading your cycle onto the carrier and it conveniently attaches onto the carrier next to the carrier track for transport. Maximum carrying capacity of 400 lbs. Fits a 2 Inch square class II, III, IV, or V - trailer hitch receiver. 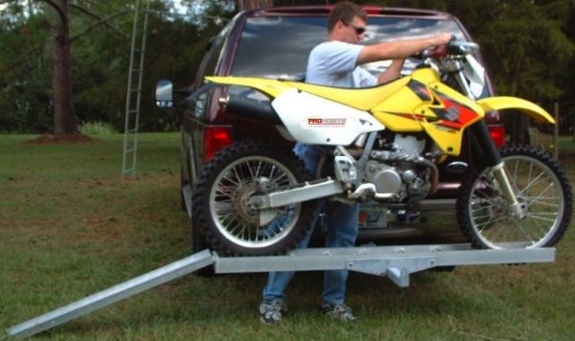 The anti-tilt trailer hitch locking device prevents the carrier from rocking. Works great for RV, campers, pick up trucks, vans and SUV. Load your cycle from the left or right (photo shows left mount; however, carrier could be bolted in a right load position also). Assembles in minutes with only 8 bolts and nuts. The hitch tube is constructed of steel with a durable gray powder coating. The main hitch tube is 18 Inch long from center of hitch pin to center of ramp.